Stay visible with Custom CFL Light Bulb (with coiled tubing) shaped magnets. 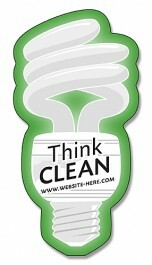 Perfect for energy companies, electricians, interest groups or promoting awareness. 1.625 in. x 3.25 in.